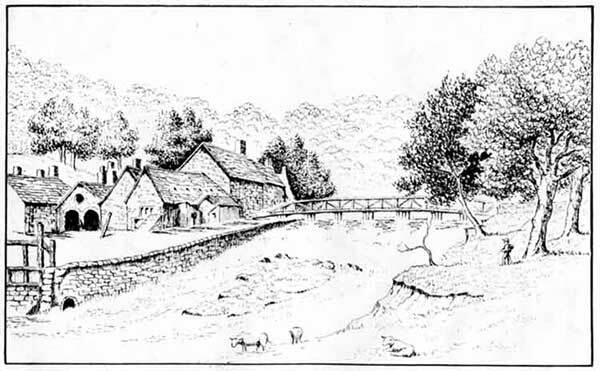 This early sketch of the Iron Forge at Ambergate c1847, owned by the Hurt family, was the site of Ambergate Wireworks. The forge became derelict and was rebuilt by Johnson and Nephew Wireworks in about 1870. 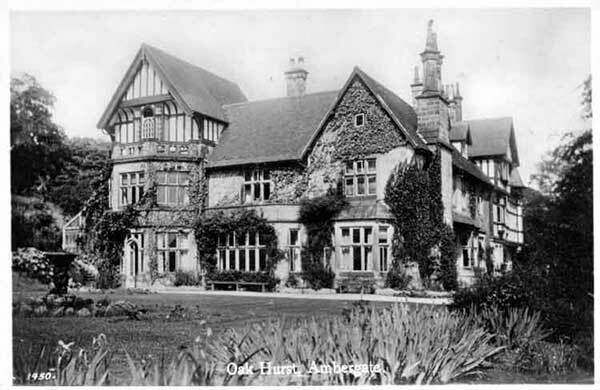 Also on the site was a mansion house called "Oakhurst" which was taken over by the Johnson family. Francis Hurt (1801–1854) knew that his unmarried daughters, Emma, Elizabeth, Selina and Frances would have to leave Alderwasley Hall after his death because it would needed by his heir, and next Lord of the Manor. He thought he would provide for them when this happened. In 1848 he had built for them a rather grand house called “Oakhurst”. However, the four daughters were having none of it and refused to move there. Oak Hurst, built in 1848, in its glory before being allowed to fall derelict. When the Johnson family took over Oakhurst they had alterations made. 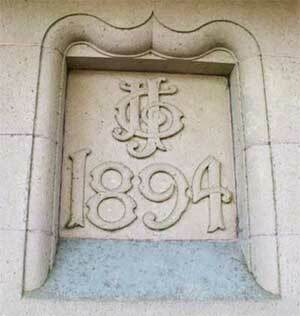 This date stone shows the Johnson logo with a date of 1894. For many years Oakhurst was the home of Thewlis Johnson, the nephew of Johnson & Nephew. In later years is was divided into apartments for managerial staff. 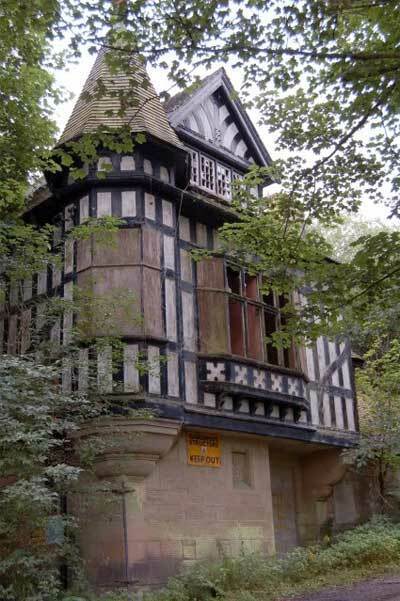 Sadly, this beautiful home is now derelict. At Ambergate, in Derbyshire, two valleys meet: the Derwent Valley, romantic, far-reaching and the quiet little valley of the Amber. The junction of their streams occurs amid surroundings of remarkable beauty. Here, many would say, is the veritable portal of the Peak Country. And here the traveller who has come thus far in quest of the characteristic charm of Derbyshire scenery feels that he has indeed arrived. Hereabouts, on the lower slope of one of the wooded hillsides bordering the Derwent, is “ Oakhurst ”; until a few years ago the residence of Mrs. Thewlis Johnson. It was on November 7th, 1924, that the late Bishop Hoskyns gathered round him a representative company of the church people of his diocese, and in faith and hope dedicated this building to the pious uses of a Retreat House. The promotion and establishment of this institution was one of the latest of the Bishop’s enterprises in the service of the Church in his diocese. To him it was also the fulfillment, after much persevering effort, of a long-cherished desire. The house will always be associated with his memory; and as long as it lasts will bear witness to the broad sympathy and wise insight which enabled him ever to keep abreast of modern movements and to read the signs of the times. The word “ retreat ”—used in a particular religious sense—is often found to need explanation. It may be taken to mean, broadly, a gathering together in retirement and quiet of a number of people who desire to escape from the atmosphere of the world for a season, in order to seek the peace and power of God; and who for that purpose obtain the help of some competent spiritual leader and guide. A Retreat, therefore, is no new thing. But during the last fifty years there has arisen a retreat movement which is a new thing. To speak in paradox, the retreat movement is a forward movement. In ever-increasing numbers during the period named, men and women, clergy and laity, representing all sections of society and all schools of thought, have been seeking and finding in retreats a method which has met their felt need. Doubtless, that need has been sharpened by the unceasing pressure and restlessness of modern life. But the growth of the movement is in chief measure due to the discovery—an important and modern discovery—that the method of a religious retreat, according to which retirement and quiet are essential, is eminently suited to the ordinary man and woman, and not only, as seems to have been generally assumed, to the exceptionally devout and the ecclesiastically minded. Ten years ago, when already a certain number of retreat houses had come into operation in various parts of the country, the Archbishop’s Committee for considering the evangelistic work of the Church reported in favour of each diocese possessing “ a retreat house which could be used not only by the clergy, but by the laity.” The time was ripe ; and speedily this counsel was translated into action. In 19x8 “ Watermillock ” was opened for Lancashire and Cheshire, and in 1919 “ Pleshey ” for Chelmsford diocese. Then came “ Carshalton ” for the diocese of Southwark, “ Catherington ” for Winchester, “ Welborne ” for Norwich, “ Ambergate ” for Southwell, and “ West Ogwell House ” for Exeter. At the present time a number of other dioceses, including St. Albans, Bradford, York, and Durham, are making plans for establishing their retreat houses. Besides the beauty of its surroundings, “ Oakhurst ” has another advantage due to its situation. Access is easy. Ambergate railway station lies at the happy distance of one mile. And there is an excellent service of trains, made possible by the converging at this point of lines from four several directions, viz., Buxton, Chesterfield, Mansfield, and Derby. Moreover, there are numerous ’buses plying on the main road within a quarter of a mile of the house. Close to “ Oakhurst ” are the works of Messrs. Johnson & Nephew, wire manufacturers. Indeed, the way to the house is through the business premises of the firm. But once past the inner gates, the visitor is hardly conscious of the nearness of this busy industrial concern. He is in the large enclosed garden of the Retreat House, with the woods and bracken above and beyond. The house itself is a fair-sized country mansion, which has proved wonderfully adaptable to its present purpose. One large and handsome upper room has been converted into a comely chapel. The conference room, dining room, and other chief rooms are commodious, well appointed, and well lighted. As many as twenty-four people can be comfortably housed at one time. All kinds of retreats are arranged for. They vary in length from five days to two. Some are for the clergy only. Others, the majority, are for the laity. Societies, guilds, groups of friends or of fellow-workers can here meet for spiritual refreshment and renewed inspiration. Of most especial value are the parochial retreats, for which people belonging to the same parish assemble here, and return carrying blessings with them. Such groups can arrange their own retreats, and choose their own conductor. The house is also available for conferences and “ schools.” The charges payable by each retreatant, and covering the expenses of his stay, are surprisingly moderate. Sister Mary, Deaconess, is the sister-in-charge. Assisted by a small but efficient staff she has ably carried the institution through its first and difficult years. A Board of Management meets each month to deal with administration and finance. “ Oakhurst ” has been in use as a retreat house for about three years. These have been years of unexpected change and consequent uncertainty in diocesan life; and the house has suffered thereby. Yet during that time its value to the Church has been abundantly proved. As for its possibilities, they have hardly been imagined, much less explored. The house has gained many friends ; its best friends being those who have here found or re-found peace of mind and joy of heart—treasures of the spirit. And now with the inauguration of the new diocese of Derby there has come a new outlook, and a new spirit of enterprise. At such a time it may be hoped that the significance of the Retreat House will be perceived as it has not been perceived hitherto; and that the vision seen by Bishop Hoskyns and others like him will be seen by all. If it be so, the clergy will be found eager to use the opportunities afforded by the house to themselves and to their parishes. And, assuredly, the laity, once they realise the fact that great blessing and real enrichment of life are brought to ordinary folk by the simple method of a retreat, will of their own accord see to it that this institution is used in the best possible way, and used to the full. Soon after WW2 ended the house was divided into about nine flats.